My third Julian is my favourite so far. After I finished the older Penguin Classic version (translated by Clifton Wolters) just before Easter, I decided that I wanted to continue reading Julian aloud, and this translation was my next choice. This is the current Penguin Classic version, translated by Elizabeth Spearing; it’s easy to find in the UK, but seems less readily available in the US (according to Amazon). Like the Clfton Wolters translation, this one also has a very good introduction. I was interested to read that analysis of Julian’s dialect can suggest that she could have moved to Norwich but have been originally from further north. Since I grew up in Sheffield, I wonder if something in Julian’s cadences reminds me of the dialect I grew up hearing. This book also has a translator’s note, which I found useful. I was fascinated to read how the translator had approached the task, particularly regarding Julian’s very long sentences. She also mentions wanting to ‘keep the sound of a woman’s speaking voice’, and I feel she achieves this very well. As a text to read aloud it is accessible and flows naturally. This translation contains both the short and long texts, which is another reason to choose this version, and retains the chapter headings, although there is no consensus on whether these were written by Julian herself or not. They have been part of the text for a very long time, and personally I find them helpful. For the most part the translation is from the manuscript known as S1, held at the British Library, although sometimes for clarification the translator has referred to the manuscript known as the Paris manuscript, held at the Bibliothèque Nationale. Unlike the Clifton Wolters translation, Spearing’s work retains the traditional wording of ‘All shall be well, and all shall be well, and all manner of thing shall be well,’ which is satisfying to find. While understanding that Wolters’ translation truly updated the words while keeping the sense of what Julian meant, I felt disappointed to not find the traditional words there. As I already mentioned, this is my favourite of the translations I have read so far. I am reading my fifth at the moment, but am a little behind on my blogging. Since I read Julian’s writings aloud, and read to hear her voice and connect with her, this works very well for me. I have already given it as a gift to several people. It’s a wonderful book. If you want to dip your toe into Julian, then the Enfolded In Love book is a lovely way to get an idea of her writing, but if you want to read the Revelations in their entirety this is the book to read. 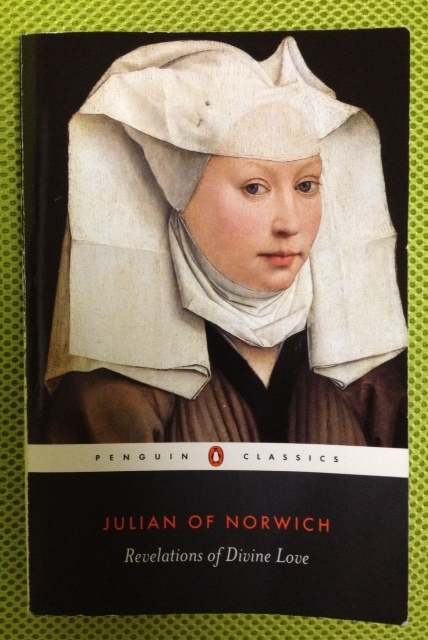 This entry was posted in Editions of Julian's writing, Julian of Norwich and tagged Clifton Wolters, Elizabeth Spearing, Julian of Norwich, Penguin Classic, Revelations Of Divine Love by tokyopurplegirl. Bookmark the permalink. I think my favorite is the Grace Warrack edition. It modernizes the language, yet retains the feel of the original text.